The main idea of our project is to create an application and web page that interconnects various city services to offer a better and much simpler user experience, and to encourage citizens to help preserve the environment. We are aware that a similar App already exists here in Barcelona, called "Bústia Ciutadana" which has the same principal that we were looking for, but we are taking the idea a step further by introducing new concepts and a different functionality. There will also be a plastic card linked to the user previously registered on the web page, that will be able to be used instead of other city cards a citizen might have. This is, instead of having different city cards, the users can optionally include them in this one. Reporting incidents around the city in real time. Using public transport and Bicing. Recycling materials like oil or batteries at green points. The points earned can then be used to get different kinds of discounts in cultural events, for example in museums, cinemas, or theaters, and also council taxes. Our motto is "Get what you give". Linked to this web application there will be a plastic card that will be able to include various city services so as to have them all in one card rather than having different cards. These services are all optional and can be added to your card once you receive it. They include Bicing, public transport, student-card, single parent card, large family card, "pink" card for the elderly or handicapped people, and so on. Each user will receive a plastic card to the address they facilitated when registering on the website. On the front side of this plastic card you will find the name and surname of the user, as well as the user's DNI and image, a contactless chip, and the city hall's logo, while on the rear side you will find a magnetic bar code and a QR code. The information contained in the QR code is thought for emergency cases. It will contain personal and medical information about the user such as the DNI number, full name, telephone number, blood type and different allergies. This way, when medics attend a patient they can scan the code to immediately know what they can provide the patient or not. The services mentioned above that can be added to the plastic card will function through this microchip, just like the actual credit cards. The web page has been created as a form of registration and social media to provide information to the citizens. 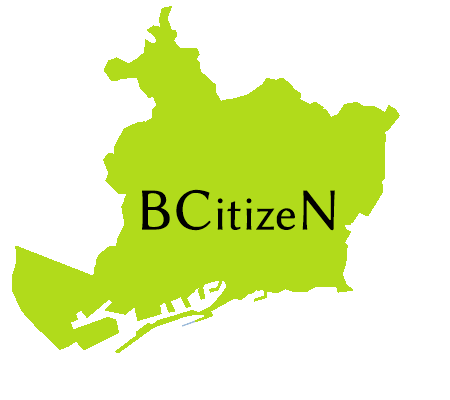 That is, in order to receive the card and start earning citizen points, users will have to first register on the web page. Anyone living in Barcelona who wants to join this new city platform will have to introduce their personal and medical information, and the DNI number will have to be a valid number. If not, the registration will not be able to take place. The web page holds different contents such as the services the user can be linked to, news posts that can be interesting for the users and a reward catalogue with all the discounts available at the moment. The mobile App linked to the platform, has basically the same functionality as the web page, with some extensions not available for the website. Users can register using this application the same way as mentioned before. On the main page of the application users will find a welcome page with a login, register and catalogue button available for non registered people, where this last one shows what types of discounts are available with city points. Once the user logs in, the app will redirect to a screen containing the personal information, the catalogue and the user's notices. These notices inform the user through a push notification about new or delayed city bills or fines, like waste taxes, traffic infractions and other.